A walk-behind round baler on demonstration. 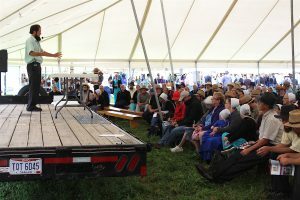 BALTIC, Ohio — Being a diversified farmer in a time when most farmers are specializing in a couple areas is not always easy, but one farmer who spoke at this year’s Family Farm Field Day, July 21, said diversification has helped him stay in business. Brad Berry, a seventh-generation farmer from Fairfield County, Ohio, raises livestock and crops on 200 acres, and directs markets his meats and eggs, along with his crops, as non GMO feed. Berry worked 20 some years for a local factory and farmed on the side, but when the factory job went away — he returned to his roots. “When that job ended, I had to use a lot of creativity to keep everything flowing,” he said. And while diversification has worked well for him — it’s also presented some challenges. On the plus-side, it’s given him a year-round market and some balance for when the markets change. 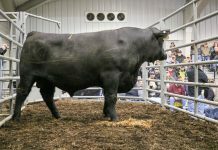 However, being diversified also means he spends a lot of time managing different aspects of his farm, from crops to livestock, and the marketing. Berry said one of the biggest challenges for a diversified farm is the labor — you need to be big enough to pay your help — but you don’t want to get so big that you lose your focus. Berry said he enjoys not having to go to the factory any more, and having more time to spend on his land and with his family. He also enjoys doing something different than his neighbors, who focus on corn and soybeans. But when it comes down to it, diversified farms still have to make a profit. 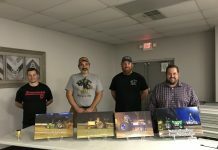 “You’ve got to like what you’re doing, and you’ve got to enjoy what you’re doing, but you’ve also got to make a profit in order to pay the bills,” he said. In a talk on backyard gardening, Henry Erb Jr. outlined some of the ways farmers can do a better job of managing their gardens as well as their produce operations. Erb operates Berlin Seeds and is known as a “certified plant addict.” He talked about different ways growers can manage weeds, insects and disease. While growers are often told to maintain their soil fertility in order to prevent weeds, he said the truth is that some weeds also like fertile soils. He said manual labor, or elbow grease, is still an effective control, but more efficient methods include pre-emergents, sprays and selective use of Roundup. A big thing with soil fertility, he said, is to remember that manure and cover crops only add so much, and that supplemental nutrients are usually necessary. 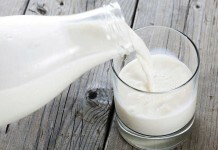 Calcium is often one of the most important, he said, because it helps balance the soil and free up other nutrients, so they’re available to the plant. Plant health ultimately depends on the health and fertility of the soil. 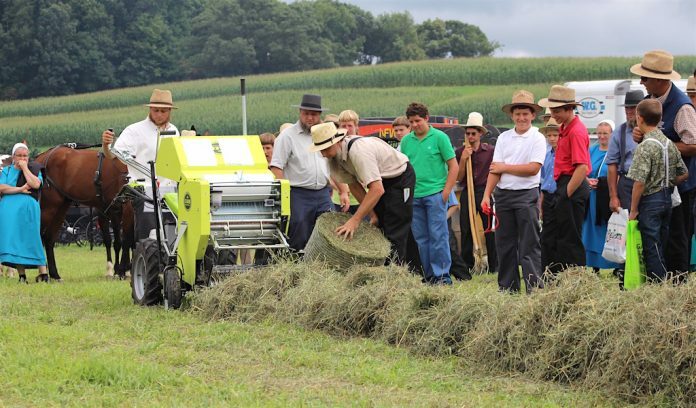 This front-mounted sickle mower was part of the demonstrations. For insects, Erb recommended a number of sprays and powders, including pyrethrin, which can be found in organic sprays. 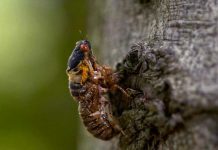 Some sprays will help deter insects, he said, but will only work with continuous application, and may not be effective at killing certain species. 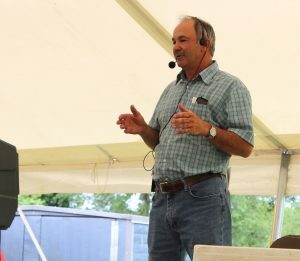 The keynote speaker was Roman Stoltzfoos, of SpringWood Organic Farm in Lancaster County, Pa. His family operates an organic dairy farm and sells organic yogurt, eggs and pastured beef. “You are the chief executive officer of what happens to you, especially when it comes to the food that you eat,” he said. He warned his audience to go easy on the sweets, and to teach children to eat responsibly — not just what tastes good. “We are all just way, way more addicted to sugar than we would want to admit,” he said. He also encouraged the audience to seek fresh foods first, and to give more emphasis to their gardens and the ability to eat fresh, raw foods that do not have to be shipped. An over-arching theme to his speech was to “suspicion the system.” He challenged people to think beyond what they are told by the government, and to think about different diseases and whether the cause may be tied to diet. 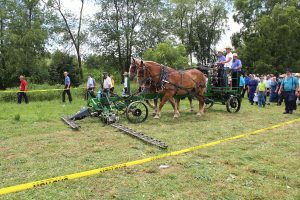 The field day drew over 4,000 people and was held at the farm of Roy L.S. and Wilma Yoder, a 97-acre dairy operated with the help of their six children. 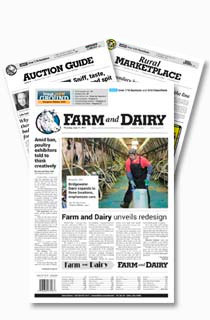 The third-generation farm produces Grade-A milk for Superior Dairy, and the farm also grows test plots for the Merit Seed Co.